Dr. Edward Kulich of Brooklyn makes balloon animals for patients Genevieve, 5, and Julian Frucht, 7, during a housecall at their Westport home on Sunday, February 13, 2011. Edward Kulich, a pediatrician who grew up in Westport, has dusted off an old-fashioned practice of making house calls instead of seeing patients in a traditional office setting. 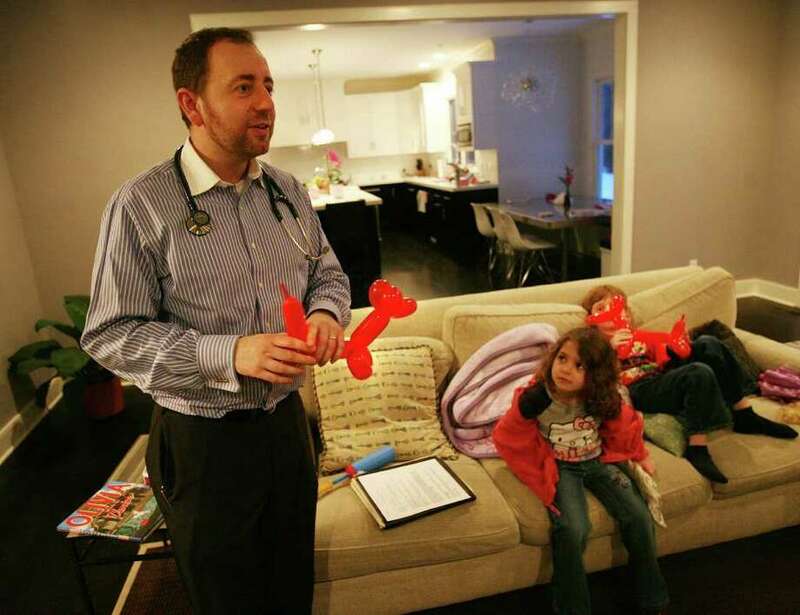 He describes himself as a "Concierge House Call Pediatrician," and his practice is called KidsHousecalls. After about two years, the prognosis for his house call practice is excellent with a steady flow of patients stretched from northern New Jersey to Westport, the farthest stop on his travels. "I had an idea that it would be a cool way to practice medicine" by making house calls, Kulich said. "My wife thought I was crazy at first. I decided to give it six months. It's worked. I get to know my patients much better going to their homes." Steve Twitchell of Westport stumbled onto Kulich when his 21-year-old son came home from college for the holidays and developed strep throat. It was a holiday weekend and the Twitchell family doctor was away. Twitchell hopped onto the Internet and Googled doctors who make house calls, and Kulich's name popped up. The doctor drove to the Twitchell home with his little black bag, did a strep test on the patient and prescribed the antibiotic treatment. In no time, the patient was good as new, Kulich said. "We didn't want to go to the ER, but my son had a fever and his throat was on fire," Twitchell said. "I went on the Internet on a lark. I found Dr. Kulich's website which had a lot of information about him. It worked out well. I would absolutely use him again in a pinch." Kulich, 33, who lives in Brooklyn, N.Y. sees the bulk of his patients in the Greater New York area. However, he is building his practice in Connecticut, primarily along the I-95 corridor with Westport as the end line. Because his roots are in Westport, he said he likes to visit the town where he grew up. To allow him to treat patients at home, Kulich's medical services are not cheap. He charges $500 up front, and takes no insurance, although patients can apply for reimbursement. Twitchell said he received a rebate of $300 from his medical insurer for Kulich's home visit. The price covers the visit, all his home testing and a drug prescription if he has it with him. Kulich said the advantage is no waiting for a doctor to call back or having to rush to a walk-in medical center or emergency room. According to Kulich, he has more than 100 clients who use him as a primary care physician and are willing to pay his fee for the convenience and quality service. He offers a special rate if a parent uses him frequently. "I'm available 24/7. People are willing to pay for that when they have a sick child," Kulich said. "There are no surprises or extra charges. I have to charge this fee to make it work. I have my expenses. I travel a lot." After practicing medicine in Tampa, Fla. in a traditional office, Kulich was dissatisfied with the impersonal conveyor belt style of patient care. He said to run a traditional medical office, a doctor has to see 30 to 50 patients daily, leaving little time to get to know patients. "What I do is a tradeoff for the 9 to 5 thing," Kulich said. "It wasn't an enjoyable work experience for me. I didn't get to know my patients. I don't like an insurance company making medical decisions for me. I don't have to jump through hoops. I have a great patient relationship with the bad stuff taken out. I'm still cheaper than going to the emergency room." He said the children he treats are more relaxed because they're in their home, surrounded with their favorite toys and family. What's more, sick children are not exposed to the germs they will encounter in every doctor's office. And parent and child don't have to sit in a waiting room for an indefinite time, all adding up to a less stressful experience for families. One advantage to his flexible schedule for Kulich is he gets to spend a lot of time with his 4-year-old son, and typically drives him to school each morning. But there is the downside -- calls in the middle of the night or at inconvenient times, such as family gatherings. At times, he might have no patients to see and has the entire day free. For example, Kulich hasn't taken a vacation since launching his house call business. Recently, he was attending a Broadway play with his wife when he had to take an emergency call. After the show, he detoured with his wife to see a patient before heading home. He's also climbed out of bed in the middle of the night on several occasions and driven more than an hour to see a sick child. The demands of his house-call practice are taxing on his family life. Kulich remembers that his wife and his son had to go on a cruise without him last summer because he had several patients that needed him. Kulich's wife, Jaclyn, has grown accustomed to her husband's erratic hours. As a mother, she realizes that he make lives easier for parents with sick children. "I am very proud of my husband for starting KidsHousecalls," she said. "I do not mind his getting urgent care calls in the evenings, or weekends or the middle of the night. I sleep with ear plugs anyway and usually don't hear the phone because he's pretty good at picking it up on the first ring." How much longer can the doctor keep up this pace, driving up and down the I-95 corridor at all hours? Kulich foresees continuing to be a concierge house call pediatrician for another 5 to 10 years. It offers him a quality family life and free time to jog and play guitar. "This is a serious lifestyle choice that's not for everyone," Kulich said. "I often have to drop everything I'm doing. I'm like Batman; I get the call and jump in my car and head off to a sick child. I'll keep doing it as long as I have the energy." For more information about Kulich, go to www.kidshousecalls.com.